From his team members on The Voice to veteran country artists, Blake Shelton has a history of demonstrating his support for the people in whom he believes; when he realized that fans across the country needed to hear music from his friends and heroes, he decided to bring them all out on the road. 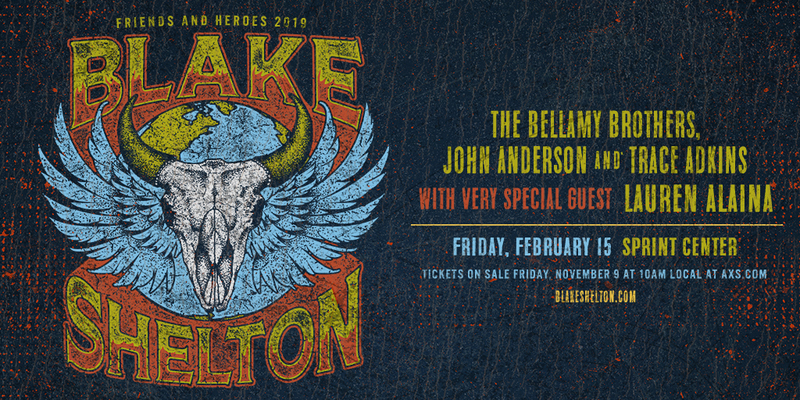 “Friends & Heroes 2019” will visit Sprint Center on Friday, Feb. 15. Very special guest Lauren Alaina joins Shelton for the run along with special appearances by country icons the Bellamy Brothers, John Anderson and Trace Adkins.